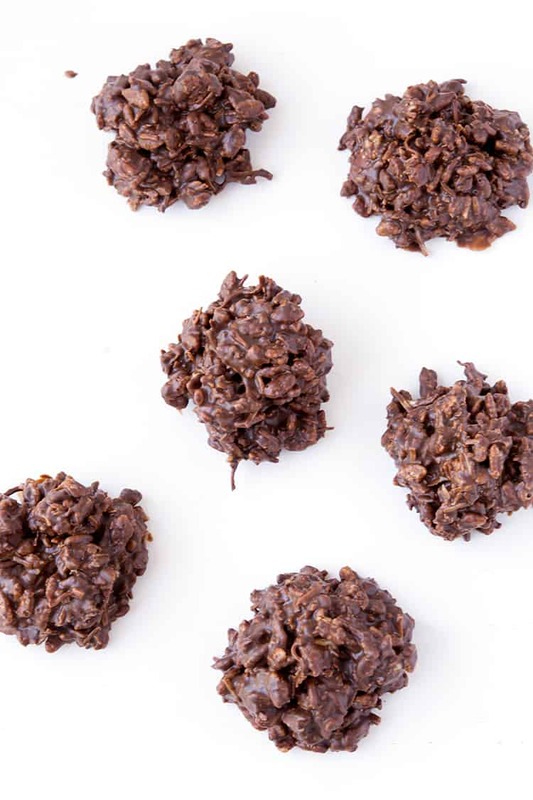 These Four Ingredient No Bake Chocolate Cookies are seriously addictive. 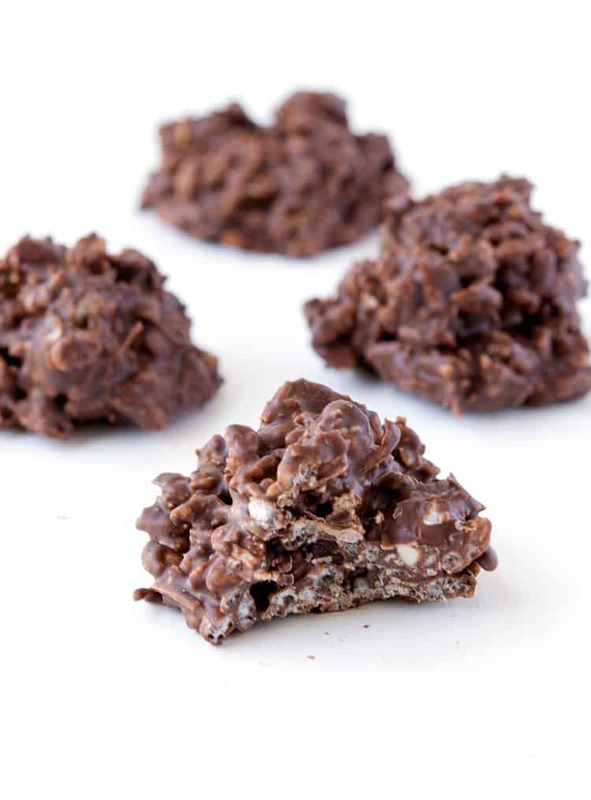 Crispy cereal, smooth chocolate and sweet coconut combine to make one wicked cookie. The best part? You don’t even need to turn the oven on! 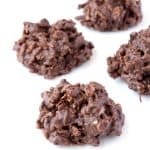 Four Ingredient No Bake Chocolate Cookies that come together in minutes, and will disappear in SECONDS. Trust me! ☺️ I just ate three! 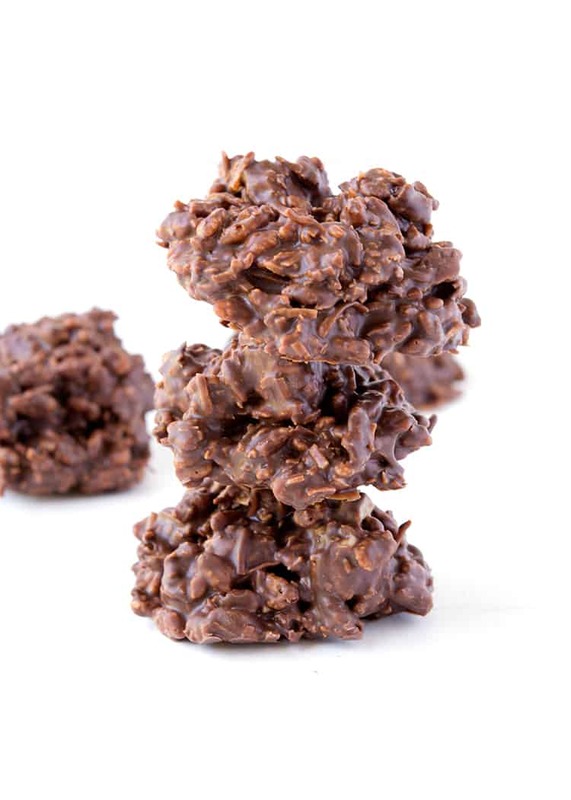 These tasty morsels are deliciously easy, with a lovely crispy, crunchy texture and plenty of chocolate flavour. And you just might have all the ingredients sitting in your pantry right now. These cookies were an accident. Most of my recipes are planned, but these cookies were anything but. I often day dream about upcoming recipes, then I go buy the ingredients, test them out, tweak them, eat them, photograph them, eat them again and then they end up here on the blog. However, sometimes inspiration just strikes. And this was one of those days. I wanted to make a quick snack, so I opened the cupboard to see what I had. And the thought of a no bake cookie came to mind. These cookies aren’t really cookies at all, but you can hold them in your hand and they are addictive. So they are similar to a cookie in some ways! But you don’t even need to turn the oven on for these chocolate treats. 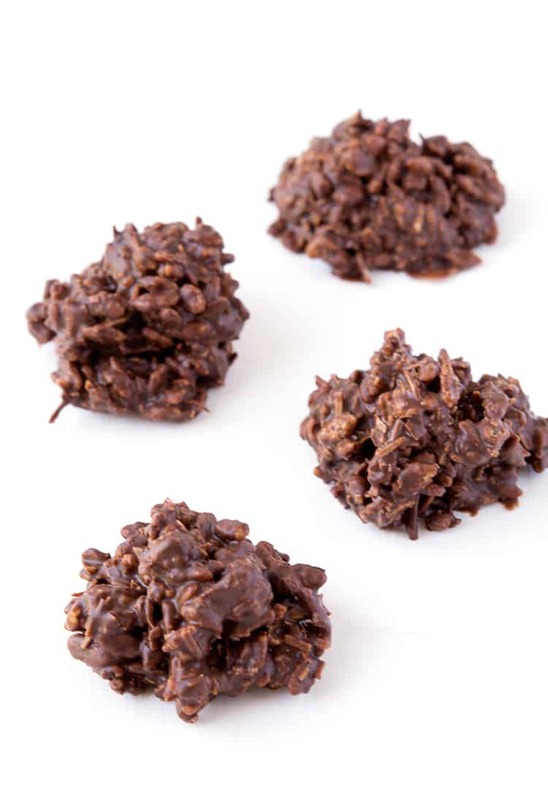 All you need is a bowl and spoon and you are well on your way to having a plateful of No Bake Chocolate Cookies. So just what are these four ingredients you ask? 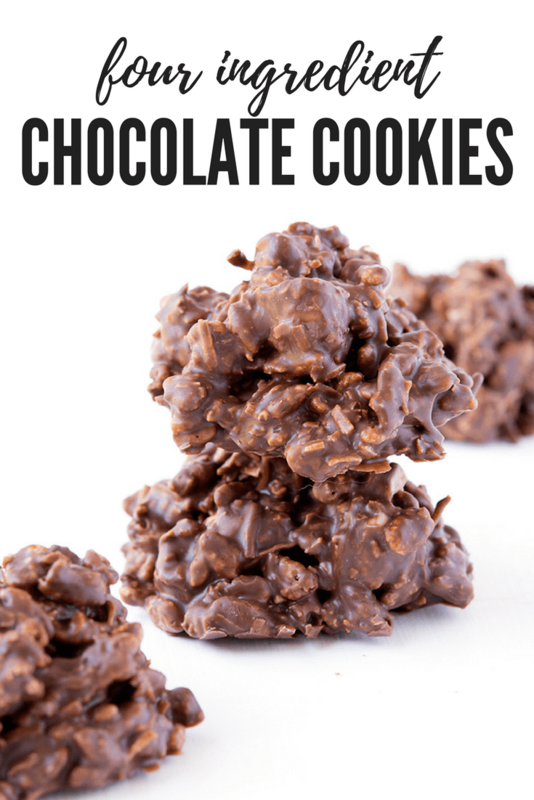 Well these cookies are made using Rice Bubbles or Rice Krispies, along with shredded coconut, chunks of white chocolate and lots of melted dark or milk chocolate. It’s the perfect storm. 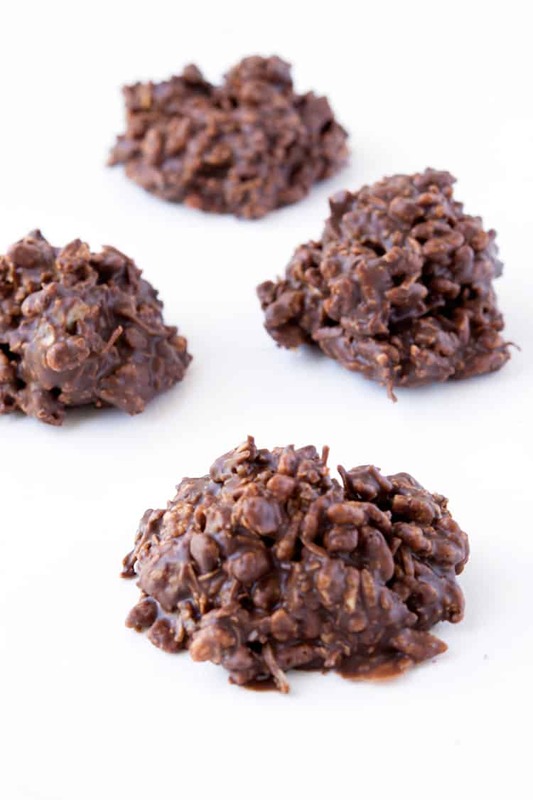 Easy 4 Ingredient No Bake Chocolate Cookies made with rice cereal, coconut, white chocolate and milk chocolate. Line a baking tray with baking or parchment paper. In a large mixing bowl, add the rice cereal, shredded coconut and white chocolate chunks and stir. Melt your milk or dark chocolate in the microwave, stirring every 20 seconds. Pour the melted chocolate over the cereal mixture and stir until completely covered. Spoon out tablespoons of the mixture onto your prepared tray. Place in the fridge for at least 1 hour or until set. Enjoy! I used a mixture of half milk chocolate and dark chocolate. 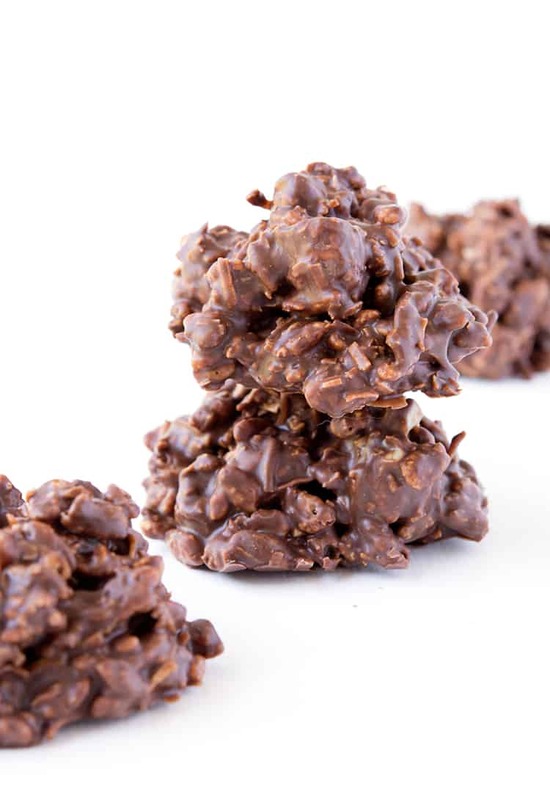 I’ve made these using corn flakes, very addicting!! Oh corn flakes! Great idea!! Cannot believe how easy these are! So you don’t melt the white chocolate? Hi Debi, no the white chocolate is kept whole, like mini chocolate chips. Hope you enjoy them! Hi SA, no worries at all! Hope you enjoy it! Aren’t they the best Karlie? A childhood fave for me! Sounds perfect Linda, I hope you love them! Need to replace coconut, what about pecans, or raisins, maybe reduce the amout of these a bit? Hi Pat, you could easily leave the coconut out. You could throw in 1/2 cup of chopped pecans or raisins, that sounds delicious! Oh my gosh, these are calling my name! I love anything with crispy rice cereal and chocolate. Add the coconut and I am in heaven! Amazing! So glad you enjoyed them!